ON THE GO OC - Things to do with your family. : TROLLS Have Taken Over the Flavors at Yogurtland! TROLLS Have Taken Over the Flavors at Yogurtland! Get Wild, Get Colorful, Get Tasty goodness NOW at Yogurtland! 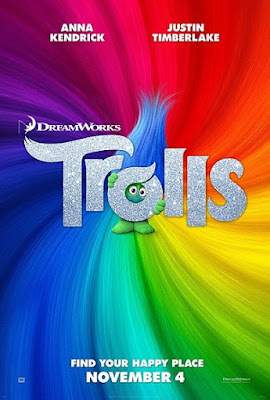 Inspired by the colorful characters of the new DreamWorks Animation film Trolls, Yogurtland, the ever-popular self-serve frozen yogurt pioneer, is introducing 10 colorful flavors, a new fun topping and two collectible spoons, available October 20th – December 21st. Trolls arrives in theaters November 4, 2016. These flavors will have Yogurtland fans singing, dancing, and smiling while enjoying one of these creamy flavors inspired by the colorfully fun characters from the film, Trolls, such as Poppy's White Chocolate Raspberry, Cooper's Caramel Apple, King Peppy's Chocolate Covered Pretzel, Branch's Peanut Butter Caramel, Guy Diamond's White Chocolate Peppermint, Creek's Butterscotch Pudding Gelato, Smidge's Cinnamon Donut Holes, and Biggie's Frosted Cookie. And for those who prefer a tangier flavor, Yogurtland is offering innovative tastes such as Satin and Chenille’s Blueberry Mangosteen Tart, and DJ Suki’s Cranberry Raspberry Tart. To complement the flavors, Yogurtland is introducing Milk Chocolate Mini Twist Pretzels as a new topping. These twists perfectly combine sweet and savory in each crunchy bite. For a limited-time only, Yogurtland has two new collectible spoons inspired by the Trolls main characters Poppy and Branch so guests can bring home the fun from Trolls and the tasty flavor from Yogurtland. These collectible spoons are only available while supplies last. Continually evolving the popular frozen yogurt trend, Yogurtland has built a growing business by redefining dessert and delivering the ultimate culinary experience. 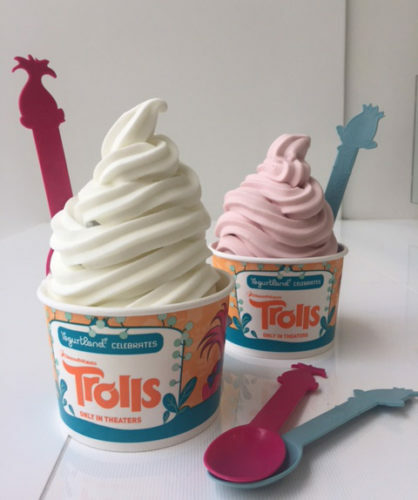 The Trolls inspired flavors created by Yogurtland’s flavorologists allow the one-of-a-kind flavors to continue to grow beyond basic taste profiles and serve people a variety of toppings to delight every taste bud. Separating Yogurtland from competitors is the company’s team of flavorologists who develop the proprietary recipes for the brand’s more than 250 different and customized flavors that are produced in the company’s own dairy plant in Paramount, Calif. Whether traditional or exotic, each flavor uses real ingredients sourced from their original locations. By controlling the entire frozen yogurt-making process, Yogurtland has raised the standards for flavors and quality to new heights much to the delight of millions of fans. All of Yogurtland’s flavors meet the National Yogurt Association Criteria for “live and active culture frozen yogurt” and are produced in a kosher-certified facility. Yogurtland features non-fat and low-fat yogurt flavors as well as non-dairy and no sugar added choices while using milk that does not contain antibiotics or added hormones. As for the sorbet, fruit flavors are fortified with Vitamin C for an extra boost. Connect with Yogurtland on Facebook, Twitter, and Instagram, add us on Snapchat at @yogurtlandinc or visit us online at Yogurt-land.com. Let me know what flavor your favorite is? !